Among the best ways of enhancing the beauty of your property is by having outdoor fireplaces installed. These amenities make it tolerable to stay extended hours outside during the winter or whenever the weather is cold outside. With these fire features, the landscape likewise becomes more interesting to look at. Additionally, having such addition to the outdoors also add market value to the property since a lot of potential real estate buyers tend to look for such amenities when considering which property to buy. Simply speaking, these outdoor amenities are overall a value for money investment that you surely won't regret having. 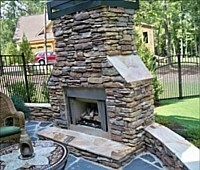 Nothing beats having customized fireplaces installed in outdoor areas. For one, romantic souls will surely appreciate the ambience that outdoor fireplaces bring, while lovers of the great outdoors will simply adore them and the feeling of closeness to nature that they exude. With custom-built fireplaces, satisfying your personal preferences is a breeze since you virtually have free reign when it comes to the materials, design, and theme of the fireplace. Hence, it is a great way of giving onlookers and guests an idea of your personality. For those who wish to enjoy the benefits of outdoor fireplaces in a jiffy, we at Four Seasons Landscape Management recommend pre-built fireplaces from Harmony Outdoor Living, Inc. or from Belgard. These companies supply us with world-class pre-fabricated fireplaces that so nicely done you won't even know that they're not custom-built! They have some of the most elegant materials that would surely entice you to avail of the pre-built ones. Belgard and Harmony Outdoor Living have several collections that will allow you to simply pick one which best suits and complements existing structures in your property. Best of all, they are guaranteed tough and will therefore last for years and decades. Another advantage of modular fireplaces is the easy and fast installation. Every great-looking fire feature requires a company skilled in designing and creating outdoor fireplaces. Luckily, we have skilled designers and artisans who have worked on hundreds of similar projects for several decades already. This makes them very capable of creating stunning fireplaces that will surely be a welcome addition to your outdoors. Best of all, we have very competitive rates for those on a budget. 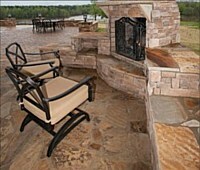 So waste no time and contact Four Seasons Landscape Management today and let us build you your dream outdoor fireplace!